Judging by the picture, you might figure that this article is about a stock picking strategy that involves the Toronto Stock Exchange (TSX) and adorable puppies. It’s not too far off actually. In this article, I’m going to talk about strong companies on the TSX that pay higher than average dividends… and everyone knows that I consider dividends adorable. 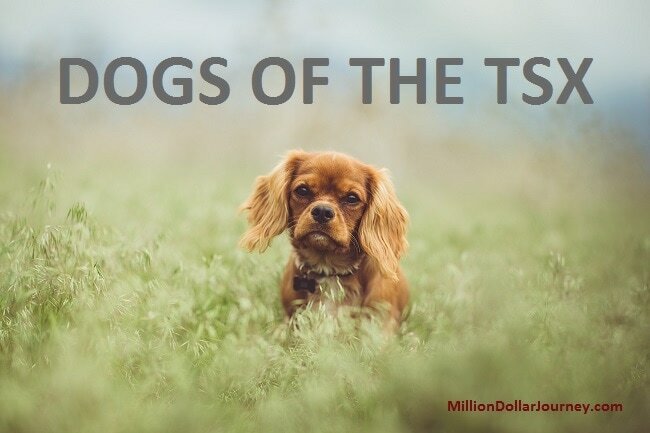 The Dogs of the TSX is a run off the popular Dogs of the Dow strategy where investors buy the highest yielding dividend stocks on the Dow Jones Industrial average (DJIA). As a little backgrounder, the DJIA is a price-weighted U.S index containing 30 stocks from the New York Stock Exchange (NYSE) and the Nasdaq. For the most part, the index includes very large US blue chip companies such as 3M, Microsoft, Walmart, Proctor & Gamble, Johnson & Johnson, ExxonMobil (and 24 others) that have a history of dividend increases. With this strategy, you sort the index by dividend yield and buy the top 10 yielding companies at the beginning of the year, and sell the following year. I’m not convinced of the buying/selling timing strategy outlined, but I can see some merit as a starting point for dividend investors. In the end, you get a selection of the largest of US companies that have a mandate to pay dividends to shareholders for the long term. Ok, so what, the Dogs of the Dow strategy is popular, but what about the Toronto Stock Exchange? Is there a Dogs of the TSX strategy? It’s actually not that hard to find. Pull up the S&P/TSX 60 index (via XIU), and its holdings will show the 60 largest publicly traded companies traded on the TSX. From there, a further sort by yield (like this site does), will give you some idea on the companies that may be a good fit for the strategy. Buy the top 10 positions, hold for one year, then repeat the following year replacing positions where necessary. Instead of brute force Dogs of the TSX, there is another popular but similar strategy called Beating the TSX (BTTSX) and is featured in Canadian Money Saver (CMS) magazine. Impressively, the BTTSX strategy has been beating the TSX by a comfortable margin over the long term. Between 1987-2013, BTTSX had an average return of 12.47% vs the TSX which had an average return of 9.89%. You may think that’s only 3 % or so, but over 27 years it’s a 76% difference in portfolio size. Choosing stocks for the BTTSX strategy is fairly straight forward. Simply sort the TSX60 by yield as indicated above, buy equal amounts of the top 10, but remove former income trusts and stocks that have history of dividend cuts. Looks like I’m not great at following rules where I picked 11 stocks rather than the 10 stated in the strategy, but no matter, the portfolio did great in 2016. Comparing to the TSX via XIC (Canadian index ETF) that returned about 22% in 2016, the picks above returned about 24%. These return numbers include dividends and calculated with XIRR. As you can see, the picks are very similar to the previous year. If I were seriously following this strategy, in 2017 I would have sold: Potash and Shaw, but added Rogers. I know it’s still early in the year, but the BTTSX portfolio is already beating the TSX by 1.5%. I’ll report back again early next year to see how this portfolio performs relative to the index. I can see merit in this strategy as investors are essentially picking quality dividend stocks and generally holding over the long term. As well, they are essentially getting the highest possible yield out of the largest blue chip stocks in Canada, and perhaps a dividend increase during the year (a number of 2017 positions above have already raised their dividend this year). Also, all Canadian dividends received in a taxable account are eligible for the dividend tax credit which can make dividends super tax efficient. The biggest issue I have is the turn over. Buying and selling year after year will incur capital gains tax if the positions are held in a taxable account. In addition, if you don’t follow the stocks closely, there may be years where a stock has abnormally high yield, which can indicate an imminent dividend cut (eg. Potash a couple of years ago). So essentially, if you are a dividend growth investor in Canada, a number of your positions will be very similar to BTTSX. One thing to look out for is diversification. There could be some years where the BTTSX contains all the banks with the remainder in telecom. 2017 isn’t too bad where it contains financials, telecom, utilities and pipelines. Overall, I like looking at these lists as as a starting point for further investigation. However, I likely wouldn’t use BTTSX as my core strategy as it has too much turn over (buying and selling). I’m more of the buy quality and hold forever. Disclaimer: I own some of the stock positions mentioned in this post. This post should be used for informational purposes only. What is the reason to be discounting or excluding income trusts – like consider a boston pizza income fund, it looks good to me – why would you exclude? thanks! Seems like our portfolios are quite similar except for three stocks, but I have the same companies in the same industry. Instead of TRP, CU and XAW,I have PPL, NPI and XSP. Overall, I think you have a great list of companies to own. Have you looked at Northwest Healthcare Properties?